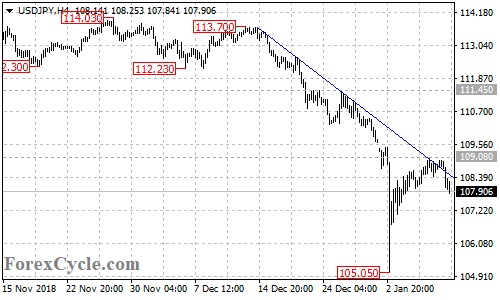 After touching the bearish trend line on the 4-hour chart, USDJPY pulled back from 109.08, suggesting that the pair remains in the downtrend from 1113.70. Further decline could be expected in a couple of days and next target would be at 106.50 area. Key resistance is at 109.08, only a break of this level could signal completion of the downtrend.